Borgward is an automobile manufacturer originally founded by Carl F. W. Borgward (November 10, 1890 – July 28, 1963). The original company, based in Bremen in Germany, ceased operations in the 1960s. The Borgward group produced four brands of cars: Borgward, Hansa, Goliath and Lloyd. The marque has since been revived by Carl Borgward's grandson, Christian Borgward, together with his partner Karlheinz L. Knöss, with assistance from Chinese investment, and unveiled the company's first new car in over 40 years, the BX7 at the 2015 International Motor Show. The origins of Bremen's most significant auto-business go back to 1905 with the establishment in nearby Varel of the "Hansa Automobilgesellschaft" and the foundation in Bremen itself of "Namag", maker of the Lloyd car. These two businesses merged in 1914 to form the "Hansa-Lloyd-Werke A.G.". After the war, in the troubled economic situation then confronting Germany, the business failed to prosper and by the late 1920s faced bankruptcy. For Carl Borgward, already the successful creator of the Goliath-Blitzkarren business, the misfortunes of Hansa-Lloyd presented an opportunity greatly to expand the scope of his auto business, and he took control of it. The first "automobile" Carl Borgward designed was the 1924 Blitzkarren (lightning cart), a sort of tiny three-wheeled van with 2 hp (1.5 kW), which was an enormous success in the market gap it filled. Traders with a small budget bought it for delivery. The Reichspost ordered many of them for postal service. In 1929, Borgward became the director of Hansa Lloyd AG having been able to merge his "Goliath-Werke Borgward & Co." with "Hansa-Lloyd. The small Goliath-Blitzkarren had by now evolved into the still three wheeler timber framed synthetic leather bodied 5 or 7 hp Goliath Pioneer. Borgward turned his attention to the other businesses and led the development of the Hansa Konsul. In February 1937, there came the new Hansa Borgward 2000 and in 1939 the name was shortened to Borgward 2000. 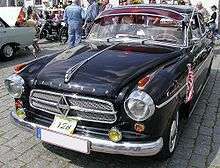 The 2000 model was followed by the Borgward 2300 that remained in production until 1942. After World War II, in 1946 Carl Borgward used some of the brand names from businesses he had acquired over the years to found three separate companies: Borgward, Goliath and Lloyd. This was intended to increase the quantity of steel allocated to his business at a time of austerity and rationing. For many purposes the companies would be run as a single entity, but in a business operated by a man to whom delegation did not come naturally the proliferation of legal entities nevertheless added unhelpful layers of complexity through the 1950s and encouraged a broadening of the range which in the end proved financially unsustainable with the sales volumes achievable. 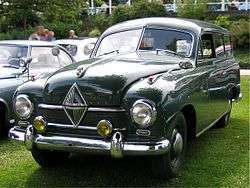 In 1949 company presented the Borgward Hansa 1500. One of the top engineers at Borgward from 1938-1952 was Dipl. Ing. Hubert M. Meingast. Production of the Borgward Isabella began in 1954. The Isabella would become Borgward's most popular model and remained in production for the life of the company. In 1960 the Borgward P100 was introduced, equipped with pneumatic suspension. Borgward introduced a line of 1500 cc sports racers in the late 1950s, with the 16-valve engine from these becoming a successful Formula Two power unit (which was also used by some F1 privateers in 1961). Although Borgward pioneered technical novelties in the German market such as air suspension and automatic transmission, the company had trouble competing in the marketplace. While larger companies like Opel and VW took advantage of economies of scale and kept their prices low to gain market share, Borgward's cost structure was even higher than necessary for its size, as it basically operated as four tiny independent companies and never implemented such basic cost reduction strategies as joint development and parts sharing between the company's makes. Borgward suffered quality problems as well. 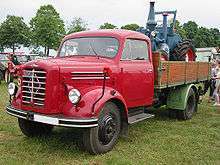 The Lloyd Arabella was technically advanced as a water-cooled boxer with front wheel drive, but plagued with problems such as water leakage and gearbox glitches. Lloyd lost money on the car even though it was more expensive than its direct competitors. In 1961, the company was forced into liquidation by creditors. Carl Borgward died in July 1963, still insisting the company had been technically solvent. This proved to be true in the sense that after the creditors were paid in full, there was still 4.5 million Marks left over from the business. Reports of difficulties at Borgward surfaced in an article that appeared in Germany's leading news magazine, “Der Spiegel” on 14 December 1960”. The very long, detailed, and in places repetitive Spiegel article was highlighted by means of a picture of Borgward, cigar in mouth, on the magazine’s front cover. It was strongly critical of Carl Borgward's business approach, and included many of the arguments later advanced to explain or justify the company's demise. The widest range of cars from any manufacturer in Germany, produced by three till recently operationally autonomous companies (Borgward, Goliath and Lloyd) was supporting a turnover of only 650 million Marks, placing the overall sales value from the combined Borgward auto businesses only in fifth position among Germany's auto-makers. The 70-year-old Carl Borgward's "hands-on" insistence on an increasingly manic proliferation of new and modified models featuring adventurous, but under-developed technological innovations ("fast manisch[e] Konstruierwut") gave rise to components which too often did not work, broke down or fell apart, resulting in massive bills for pre-delivery remediation and/or post delivery warranty work that found their way back to the company. The December 1960 Spiegel article was not the only serious public criticism targeting Borgward at this time: suddenly stridently negative (if more succinct) comments also turned up in the influential mass-market Bild newspaper and in television reports. Critical media commentaries also appeared concerning large loans to the Borgward Group provided by the local Landesbank. At the end of December 1960 Borgward approached the bank for a further one million Marks of credit, the loan to be backed by a guarantee from the Bremen regional government which initially the Bremen senators agreed to provide. However, following the flood of critical press comment the senators withdrew their guarantee. They now required Carl Borgward to pledge the company itself to the state in return for the guarantee. After a tense 13-hour meeting widely reported in a still hostile media, Borgward agreed to the senate’s terms on 4 February 1961, thereby averting the bankruptcy of the business. The Bremen Senate also insisted on appointing its own nominee as chairman of the company’s supervisory board. The man they chose was Johannes Semler whom reports generally describe as a “Wirtschaftsprüfer” (public auditor), though this designation, especially once translated into English, does less than full justice to the breadth of Semler’s career. He had studied law at university and worked initially as a lawyer. The scion of a leading Hamburg political family, in 1945 he had himself been a founding member of the centre-right CSU party, and was a member of the Bundestag between 1950 and 1953. Despite his Hamburg origins, Semler was by this time based in Munich, with a network of contacts in the Bavarian establishment that probably included fellow CSU politician and the future German chancellor, Ludwig Erhard, who in 1948 had succeeded Semler in a top administrative position within the Bizone. The appointment of Johannes Semler as the representative of the Bremen senators to chair the Borgward supervisory board would, in retrospect, contribute to the controversy that followed the Borgward bankruptcy. On 28 July 1961 Semler, as Chairman of the supervisory board joined the directors of the three companies Borgward, Goliath and Lloyd to instigate proceedings for the establishment of a “Vergleichsverfahren”, which would have provided for a court sanctioned scheme of arrangement enabling the business to continue to trade while at the same time protecting the interests of creditors. Two months later, however, in September 1961, the Borgward and Goliath businesses were declared bankrupt, followed in November by the Lloyd business. Subsequent “conspiracy theorists” have suggested that Semler, for reasons of his own, never had any intention of allowing the Borgward auto-businesses to survive. Carl Borgward himself would not accept that the Borgward, Goliath and Lloyd auto businesses were technically insolvent, and the fact that none of the companies’ creditors lost money supports his case. In the light of what was known at the time, and increasingly in the light of subsequent events, the argument that the business was not really insolvent at all has, if anything, gained support. Nevertheless, evaluation of the issues requires informed and careful judgement, and the opposite case can also be made, that had the company continued trading beyond 1961 there was no reasonable prospect that it would generate sufficient cash to repay existing debts within a contractually established or reasonable period nor, indeed, to repay all necessary subsequently incurred financing and other business debts. At best, Borgward by the middle of 1961 was seen by potential investors and lenders as a much riskier prospect than it had been a year earlier. It has been suggested that the media onslaught launched against Borgward at the end of 1960 was part of a well orchestrated covert campaign by other German auto-makers, jealous of Borgward’s success and spotting an opportunity to eliminate a significant rival. Even now, the Spiegel article of 14 December 1960 is strangely shrill, partisan, and out of line with the dry tone that characterised most serious business reporting at the time. Johannes Semler, appointed by the city fathers to chair the supervisory board, ostensibly, in order to guide the business towards a more secure future, appeared a strange choice for the role despite his excellent network of contacts and long experience at the interface between business and public life. The appointment appeared stranger still after his simultaneous appointment, in 1960, to the board of BMW in Munich, his more recent political power base and by now his adopted home city. BMW had lost its old manufacturing facility in 1945 when Eisenach had ended up under Soviet control and since then had itself struggled to survive financially. In fact, the appointment of Semler to the BMW board was one of several events which, in rapid succession, marked an improvement in the fortunes of BMW. BMW had itself come close to bankruptcy in 1959, but had been rescued thanks to a massive additional investment by Herbert Quandt, who became, behind the scenes, a remarkably successful “hands-on” principal BMW shareholder. Key to the company’s future was a new saloon/sedan smaller and more sporty than a Mercedes-Benz yet larger than a Volkswagen, and more stylish than anything then to be expected from Opel or Ford. Quandt also recruited an energetic sales director for BMW called Paul G. Hahnemann who later would assert that the BMW 1500, launched at the Frankfurt Motor Show in September 1961, created an important new niche in the German car market. Hahnemann repeated his boast so often that he gained the soubriquet "Nischen-Paule" in the press. Those who contend that Semler's role in the Borgward bankruptcy was part of a conspiracy orchestrated on behalf of BMW to bring down Borgward point out that the “niche” allegedly defined by the mid-weight BMWs from 1961 actually bore an uncanny resemblance to the niche previously occupied by the Borgward Isabella during the 1950s. Cases against conspiracies are seldom as compelling as cases in support of conspiracies. Nevertheless, Carl Borgward’s management style had never been collegiate, and during several decades as a swash-buckling engineer-entrepreneur he had never shown much appetite for opinions at variance with his own. The Spiegel article that kicked off the press onslaught in December 1960 included a withering attack on Borgward for having recently laid off 2,000 people as part of a belated attempt to streamline administration and production. In a period of boom there was little doubt that the affected workers would have found job opportunities with other German automakers, but they would have needed to relocate away from Bremen, and the Spiegel’s description of Carl Borgward’s implementation of the redundancies savagely implied a singular absence of human sensitivity. One way and another, Borgward had over several decades enjoyed plenty of opportunities to create enemies, able to feed toxic stories to the media without any need for a conspiracy among rival auto-makers. Borgward’s approach to “product planning” was remarkably profligate. In West Germany only Opel, at this time, came close to Borgward in terms of frequency of model changes and facelifts. But Opel were backed by the financial muscle and the strong management support of General Motors, the world’s largest auto-maker and at that time itself a fabulously profitable corporation. In contrast, Borgward had only a generous (but not bottomless) credit facility from the local state bank which he coupled with a personal disinclination to delegate or discuss business decisions. Opel, for all their flamboyant marketing and a domestic market share second only to that of Volkswagen, at this time offered only two models, the Rekord and the Kapitän. It is difficult to keep up with how many different models the Borgward group was supporting. 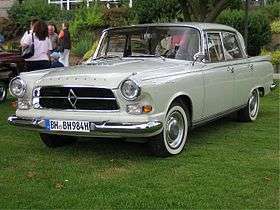 In addition to various commercial vehicles, the 1961 passenger car range included the Lloyd Alexander, the Lloyd Arabella, the Goliath 1100 (rebadged in 1959 as the Borgward 1100), the Borgward Isabella and the Borgward P100. The company’s reputation for serious teething troubles on new models was not simply the result of malicious press reporting. Borgward was managed by a 70 year old autocrat without an obvious succession plan. At the height of the crisis talks in 1961 Carl Borgward received (and robustly rejected) a 200 Million Mark offer for his business from Chrysler corporation. Even without his own personal BMW connections, chairman Semler might reasonably have concluded that the Borgward business as then configured had no realistic prospect of remaining solvent for more than few more months without collapsing into a yet more destructive bankruptcy from which creditors would not recover all their cash, and which could easily end up with the company becoming a third significant foreign transplant to compete on financially unequal terms with the domestically owned auto-industry. The German magazine Der Spiegel published a thoughtful piece in 1966, implying that with more a little more support, and if the proprietor had been more willing to take advice from his own directors, the Borgward company could have easily overcome its financial problems of 1961. But Carl Borgward was financially naive and reluctant to accept advice: his preferred source of credit had always involved shunning the banks and simply taking extra time to pay his creditors, rejecting advice on the financing of his business from his own Finance Director. By Autumn 1960 he was holding on to unpaid creditor invoices worth more than 100 Million Marks for sheet metal and tyres alone. Given that all the company's creditors were eventually paid in full, the liquidation decision appeared nevertheless to have been taken prematurely. Borgward Argentina was founded in 1954 as a joint venture of Carl F. Borward HMBH and IAME (Aeronautics and Mechanical Industries) intended to equip the Rastrojero, a small pickup truck. The engine was manufactured at the plant that Borgward had in the town of Isidro Casanova, Buenos Aires province, at a production rate of 20 units per day with almost 800 employees. The production of Borgward Isabella was carried out in Cordoba city, by using Argentine engines, local components (glass, batteries, tires) and other pieces from Germany. This model production started in 1960 at the booming of Argentina automotive industry development, with a production plan of 500 units for that year. When the German parent company closed its doors in 1961, the operation happened to have local control, and continued for a short time to complete the total manufacture of 1,050 cars during its short life in Argentine territory. As part of the bankruptcy process, in 1963, all manufacturing equipment for the Borgward Isabella and P100 was sold to a buyer in Mexico. Production in Mexico was delayed, but was started in August 1967 by entrepreneur Gregorio Ramirez Gonzalez. Production in Mexico ceased in 1970. On May 21, 2008, Christian Borgward, grandson of Carl F. W. Borgward, together with his partner Karlheinz L. Knöss, founded Borgward AG in Lucerne (Switzerland). In 2005 Borgward (President) and Knöss (CEO and Vice President of the Supervisory board) started the revival of Borgward. They started the development of the new Borgward automobiles with Norwegian stylist Einar J. Hareide, who had previously worked on the Mercedes-Benz E-Class, set up the organisation and engineer team and developed a car concept. Christian Borgward owns the brand Borgward. Borgward AG is responsible for the development, production, sales and marketing of Borgward cars, ships and aircraft. Borgward has announced plans for a new car at the 2015 Geneva Motor Show after a 54-year hiatus. The new company will be backed up financially by Chinese truck manufacturer Foton. The Borgward BX7 SUV was introduced at the IAA, Frankfurt in September 2015. and sales in China started in July 2016. A concept version of a second, smaller SUV, to be named BX5 when in production is to be announced at the 2016 Geneva Salon. ↑ Oswald, Werner (2001). Deutsche Autos 1945-1990, volume 4 (in German). Motorbuch Verlag. p. 424. ISBN 3-613-02131-5. ↑ Oswald, Werner (2001). Deutsche Autos 1920-1945, volume 2 (in German). Motorbuch Verlag. p. 150. ISBN 3-613-02170-6. 1 2 Odin, L.C. World in Motion 1939 - The whole of the year's automobile production. Belvedere Publishing, 2015. ASIN: B00ZLN91ZG. 1 2 Ulf Kaack (2012). Minimalismus auf vier Rädern. Borgward: Das Kompendium. GeraMond Verlag, München. p. 76. ISBN 978-3-86245-667-3. ↑ Ulf Kaack (2012). Der Konkurs - Untergang des bremischen Automobilimperiums. Borgward: Das Kompendium. GeraMond Verlag, München. pp. 17–19. ISBN 978-3-86245-667-3. ↑ Ulf Kaack (2012). Traum-Pkw und robuste Lkw. Borgward: Das Kompendium. GeraMond Verlag, München. pp. 23–25, 27. ISBN 978-3-86245-667-3. ↑ Borgward History Archived March 20, 2012, at the Wayback Machine. ↑ Vensky, Hellmuth (27 July 2011). "Der Niedergang eines Wirtschaftswunder-Unternehmens". ZEIT ONLINE. Retrieved 2013-05-14. Fraglich ist aus heutiger Sicht, ob Borgward tatsächlich zahlungsunfähig war: Am Ende des Verfahrens werden die Ansprüche aller Gläubiger befriedigt, es bleiben sogar 4,5 Millionen Mark übrig. 1 2 Augstein, Rudolf; Becker, Hans Detlev, eds. (14 December 1960). "Der Bastler". Der Spiegel. 1960 (51). Retrieved 2013-05-15. Wie kein anderer Automobilfabrikant der Welt hetzte Carl F. W. Borgward in seinen drei Werken von Neukonstruktion zu Neukonstruktion…. Modelle, Typen und Marken entstanden und verschwanden, tauchten mit abgewandelten Formen, veränderter Ausrüstung und ausgetauschten Marken wieder auf und hinterließen beim Käufer die Empfindungen eines Wechselbades. ↑ Vensky, Hellmuth (27 July 2011). "Der Niedergang eines Wirtschaftswunder-Unternehmens". Die Zeit. Retrieved 2013-05-14. Es ist nicht die einzige kritische Geschichte, die in diesen Tagen über Borgward geschrieben wird. Heutige Fans der Marke vermuten eine Verschwörung der Konkurrenz hinter dem plötzlich so schlechten Image, das Berichte in Bild-Zeitung und Tagesschau hinterlassen....Die öffentlich-rechtliche Bremer Landesbank gewährt dem Konzern hohe Kredite, die [auch] in den Medien kritisch thematisiert werden. ↑ Vensky, Hellmuth (27 July 2011). "Der Niedergang eines Wirtschaftswunder-Unternehmens". Die Zeit. Retrieved 2013-05-14. Neben den Problemen mit der Modellpolitik schwächen rückläufige Verkaufszahlen im für Borgward wichtig gewordenen US-Markt die Liquidität der Firma..
↑ "AUTOS: Compacts in Paris". Time Magazine, Oct. 17 1960. October 17, 1960. ↑ Vensky, Hellmuth (27 July 2011). "Der Niedergang eines Wirtschaftswunder-Unternehmens". Die Zeit. Retrieved 2013-05-14. Ende 1960 beantragt Borgward einen weiteren Millionenkredit, um über den Winter zu kommen – in der kalten Jahreszeit werden weniger Autos verkauft. [...] Borgward willigt am 4. Februar 1961 nach 13 Stunden dramatischer Verhandlungen mit dem Senat ein, um die Insolvenz zu vermeiden." ↑ Vensky, Hellmuth (27 July 2011). "Der Niedergang eines Wirtschaftswunder-Unternehmens". Die Zeit. Retrieved 2013-05-14. Der Senat beruft den Münchener Wirtschaftsprüfer Johannes Semler zum Vorsitzenden des Aufsichtsrates. ↑ Vensky, Hellmuth (27 July 2011). "Der Niedergang eines Wirtschaftswunder-Unternehmens". Die Zeit. Retrieved 2013-05-14. ...für die Verschwörungstheoretiker unter den Borgward-Fans gefundenes Fressen, denn Semler hat den gleichen Job auch bei BMW in Muenchen, damals ebenfalls ein Sanierungsfall. ↑ A similar process in the USA would involve a Chapter 11 bankruptcy. ↑ Vensky, Hellmuth (27 July 2011). "Der Niedergang eines Wirtschaftswunder-Unternehmens". Die Zeit. Retrieved 2013-05-14. Am 28. Juli 1961 beantragen der Aufsichtsratschef der Holding und die drei Geschäftsführer der Borgward-, Lloyd- und Goliath-GmbH die Eröffnung von Vergleichsverfahren. Diese gerichtlichen Verfahren haben im damaligen Insolvenzrecht den Sinn, einen Konkurs noch abzuwenden. Doch im September 1961 gehen Borgward und Goliath, im November Lloyd in Konkurs. ↑ Augstein (, Rudolf; Becker, Hans Detlev, eds. (14 December 1960). "Der Bastler". Der Spiegel. Retrieved 2013-05-15. Ein Liebesgabenpaket mit Kaffee und Branntwein war für rund zweitausend Bremer-Automobil-Arbeiter das letzte Zeichen der Verbundenheit mit ihrem Lohnherrn, Dr.-Ing. E. h. Carl F. W. Borgward, der auch eine persönliche Widmung beigelegt hatte. Bald nach dem Präsent, das der Herr des Hauses Borgward ihnen an seinem 70. Geburtstag durch die Post hatte überreichen lassen, schickte er ihnen die Kündigung. ↑ Rudolf Augstein (proprietor and former managing editor), Hans Detlev Becker (managing editor) (14 December 1960). "Der Bastler: "Das Auto - Motor und Sport" umreißt die Bremer Praktiken mit der Feststellung: "Kein langwierig abwägender Mehrheitsbeschluß eines Vorstandes, Aufsichtsrates oder sonst irgendeines Managements führten zu dieser Borgward-Programm-Erweiterung nach oben, sondern der ganz persönliche Wille und die Markteinschätzung dieses heute schon 70jährigen, mit unverminderter Energie disponierenden Mannes, eines der letzten Pioniere seiner Branche. "So wie die Leitung des Geschäftes, so zeigt sich auch seine Basis. Man geht allenthalben direkt die Dinge an, etwas hemdsärmelig zuweilen, und stets bereit, sich Neuentwicklungen zu bedienen, wo immer sie sich darbieten.""". Der Spiegel. Retrieved 2013-05-15. ↑ Augstein, Rudolf; Becker, Hans Detlev, eds. (14 December 1960). "Der Bastler". Der Spiegel. 1960 (51). Retrieved 2013-05-15. Obwohl ihn schon die Geier der amerikanischen Super-Autofirmen umkreisen - die Chrysler-Corporation bot 200 Millionen Mark -, zeigt sich Carl F. W. Borgward entschlossen, seine Sonderstellung zu halten. 1 2 History of Borgward Archived March 3, 2016, at the Wayback Machine. ↑ Augstein, Rudolf; Jacobi, Claus, eds. (12 December 1966). "Hüter des Hauses". Der Spiegel. 1966 (51). Retrieved 2013-05-15. So tüchtig wie als Konstrukteur, so naiv war Borgward im Umgang mit Geld. Er lehnte Bankkredite ab und finanzierte sich über seine Lieferanten, deren Rechnungen er jeweils erst nach drei Monaten beglich.....Da er überdies ständig neue Typen entwickelte und keinen Widerspruch duldete (Borgward zu seinem Finanzdirektor Carstens: "Sie sind ja doof, ich weiß schon, wo mein Geld bleibt"), waren seine Finanzen schließlich durcheinander geraten. Im Herbst 1960 schuldete das Unternehmen den Blech- und Reifenlieferanten mehr als 100 Millionen Mark. ↑ Augstein, Rudolf; Jacobi, Claus, eds. (12 December 1966). "Hüter des Hauses". Der Spiegel. Retrieved 2013-05-15. Als der Bremer Autokonzern 1961 zusammenbrach, tauchten die ersten Zweifel am deutschen Wirtschaftswunder auf. Heute zeigt sich, daß Borgward voreilig in den Konkurs getrieben wurde. ↑ "Borgward Factory Argentina". Borgward.uk. Retrieved 2010-06-12. ↑ "News and views: Borgward in Mexico". Autocar. Vol. 127 (nbr 3732). 24 August 1967. p. 52. ↑ "Brief Borgward History". Borgwardisabella.com. Retrieved 2010-06-12. ↑ "Handelsregister des Kantons Luzern". Hralu.ch. 2008-06-24. Retrieved 2010-06-12. ↑ "Archived copy". Archived from the original on 2015-08-01. Retrieved 2010-04-15. ↑ Kalogianni, Alexander (9 February 2015). "Borgward heralds its return after 50 years with Geneva Auto Show announcement". Digital Trends. Retrieved 14 February 2015. ↑ "German maker Borgward is back!". Topgear. Retrieved 19 February 2015. ↑ Coyle, John (28 February 2015). "China's Foton Set To Launch Revival Of Borgward At The Geneva Motor Show". Motor Authority. Retrieved 31 March 2015. ↑ "Archived copy". Archived from the original on 2016-04-23. Retrieved 2015-09-18. ↑ Demandt, Bart (14 August 2016). "New model introductions in China, July 2016". Left-Lane.com. Wikimedia Commons has media related to Borgward vehicles.